How some dahlias, white, yellow, red or purple, get their color is well known, but the molecular mechanism behind the black dahlia has been a mystery. A new study shows that the distinctive black-red coloring is based on an increased accumulation of anthocyanins as a result of drastically reduced concentrations of flavones. Dahlia variabilis hort. is a popular garden flower. Continuous dahlia breeding worldwide has led to the availability of a huge number of cultivars, 20,000 varieties, many of them showing red hues. 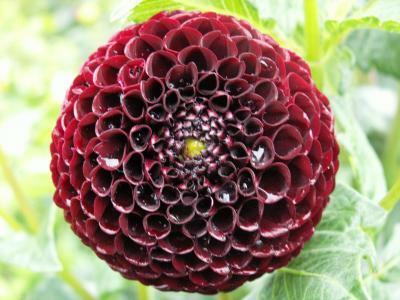 However, black hues of dahlia flowers occur rarely, in comparison. Flower color in dahlias is exclusively based on the accumulation of metabolites called flavonoids, such as anthocyanins, flavones and flavonols. It's known that red tones arise from anthocyanins, whilst white and yellow tones lack anthocyanins but contain large amounts of flavones and chalcones respectively. Flavones and flavonoids are colorless, but they influence flower coloration by acting as co-pigments, interacting with anthocyanins to stabilize their structures. It is assumed that flavones rather than flavonols are the predominant co-pigments present in dahlias since all cultivars show high flavone synthase II (FNS) enzyme activity and low flavonol synthase activity. To examine the biochemical basis for the distinctive dark coloring of the black dahlia, the research team from the Vienna University of Technology in Austria used pigment, enzyme and gene expression analyses. They determined that the majority of black cultivars have very low concentrations of flavones, as confirmed by low FNS II expression. Since flavones compete with anthocyanin biosynthesis for common intermediates, the lack of flavones favors the accumulation of huge amounts of anthocyanins that are found in black dahlias. The flavonol contents of black dahlias increased slightly parallel to the decrease of flavones. Heidi Halbwirth, lead author of the new paper, emphasized that the black color of dahlias is not due to increased activity of the anthocyanin pathway, but rather is the result of the intermediates being converted into anthocyanins at the expense of formation of flavones. Halbwirth said, "The molecular explanation for the specific suppression of flavone formation in the majority of black dahlias will be of interest for further research. As the dahlia is an octoploid plant and the presence of several alleles is expected, the simultaneous suppression of all FNS II isoenzymes indicates an effective mechanism that could be used for engineering plants with tailor-made flavone contents."